Happy Thursday y'all! Today I'm sharing another left over page from my DLP 2015 journal. This one actually wasn't a "left over" page. It was a "messed up page". I created a highly layered background but it wasn't popping enough for me. It just wasn't as bright as I really wanted it to be. So I skipped over and created this page instead. I left this page for months because I just didn't know what I wanted to do with it. The background was really too busy in my opinion for much and I waited for inspiration to strike. It finally struck me! A fun reverse silhouette page! I pulled out my Dylusions Suites & Lottie stencils and Black Marble Dylusions paint and I covered up almost all of that background. Much better! White Linen Dylusions Paint and a Prima Honeycomb stencil created the polka dotted background. 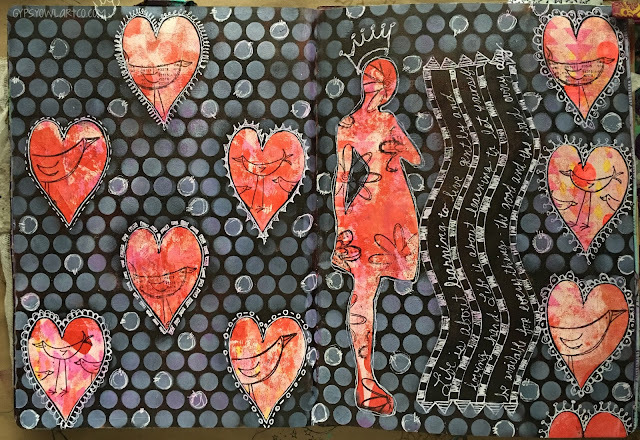 I used the Dylusions Journal Block and my white Signo pen to create the sideways journaling and the doodles around the hearts, dots, and Lottie. I placed the stencil over the hearts, exposing the colored parts and stamped the birds from the How Does Your Garden Grow stamp set. I used the flowers from the same set inside Lottie. I really like using this technique to cover up an otherwise really ugly background! Very effective and I like a little bit showing through. Plus y'all know how much I love doodling on a black background! Just remember y'all... no matter how ugly you think something is, you can work and work and work it to make something nice! Check back tomorrow for another Left Over page share!